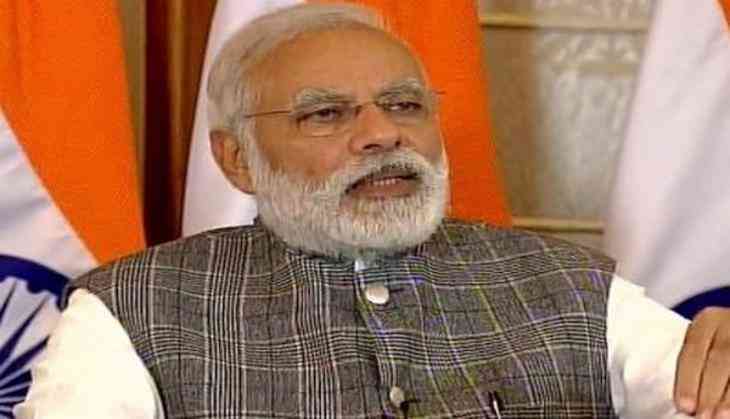 Interacting with a group of over 70 Additional Secretaries and Joint Secretaries of the Government of India, Prime Minister Narendra Modi said the combination of development and good governance is essential for the welfare and satisfaction of citizens. The prime minister, who attended the first of five such interactions on 23 August, asserted that good governance should be a priority for the officers. He even emphasised the need for all wings of the government to work in harmony, and synchronisation, to achieve the best possible results. He said all officers must keep the poor and the ordinary citizens in their minds while taking decisions. The Prime Minister told the government officials that the world is looking to India with positive expectations and the entire world feels that a successful India is vital for a global balance. "There is a strong undercurrent for excellence from the common citizens of India. Youth from humble backgrounds, with very limited resources are achieving the best positions in competitive exams and sports," he said and asked the officers to work to promote this spontaneous upsurge of talent, recalling the spirit and energy that they themselves would have possessed in the first three years of their service. Prime Minister Modi said this was a unique opportunity for the officers to deliver their utmost for the benefit of the nation. He emphasised on the importance of breaking silos, and efficient internal communication between various departments of the Government and underlined the necessity of speed and efficiency in decision making. "An honest decision making with a good intention will always be encouraged by the Union Government," he said. He also asked the officers to focus their attention on the 100 most backward districts of India, so that they can be brought up to the national average-level, on various development parameters. During the interaction, the officers also shared their experiences on subjects such as a digital and smart governance, administrative procedures and accountability, transparency, doubling of farmers' income, skill development, Swachh Bharat, consumer rights, environment protection, and building of New India by 2022.